Cuween Hill - Earth covered cairn -- tomb? 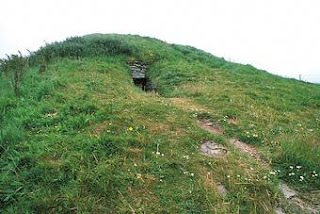 These tomb-hills were usually first built as dolmens, then stones were piled around and over them creating huge cairns, then earth was used for the final protection and covering. Creating this man made "cave" tomb also helped perserve the contents, including the objects once the large stone was placed over the door! 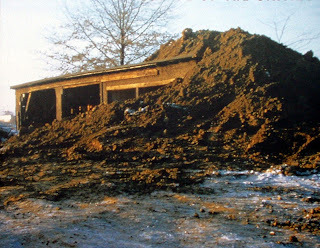 The relationship of the Woodshed to an ancient tomb, is important. This peice was created at Kent State - an architypal anti-war university during the Vietnam War days. Was Smithson making a statement about the social construct of the time? This is a piece I built from stones collected from 10 water sources in Rappahanock County Virginia. I traveled to these sources with a local friend and we chose about 10 stones from each source. I have set up this cairn at various places in Virginia and Vermont - at times I place an audio piece with the speakers either above or inside the cairn. The audio piece has sounds derived from walking and searching for sites. The bench is also part of the piece - it comes from my family's yard and is from the 1960's. 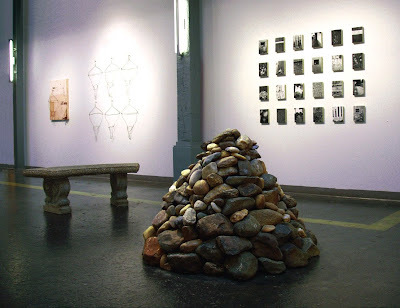 The bench reflects a modern and archetectural use of stones, which gives the piece a historic reference and creates a mirroring effect of time, earth, and man-object.